Reviews of my Statistical Analysis with R book have started to emerge online and I am writing today to share them with potential readers and recommenders. The following is a list of online reviews for Statistical Analysis with R. If you have written a review of the book and would like it to be featured in this post, please contact me. 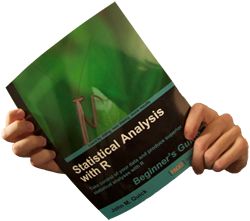 In summarizing the reviews, a few points are very clear about Statistical Analysis with R.
It is for beginners: The book was written for people who have little to no experience with R, statistical software, and programming. It makes no assumptions of prior experience along these lines and starts right from the beginning. If you are new to R and want to learn how to apply it to your work, then this book is for you. If you are already an intermediate or experienced user, perhaps you might recommend it to people you know who are just becoming familiar with R.
It is a learning tool, not a reference: The book is structured with the intent that it is experienced as a holistic learning experience. The chapters build on one another and progressively delve deeper into R. It is not a dictionary-style reference that one might pull out, flip to an entry, and get a brief answer on a single item. Again, this has implications for the audience. Beginners are more likely to enjoy this approach, whereas experienced users may be interested in more of a reference-style book. It has a story: Woven into the book’s learning structure is a storyline based on the Three Kingdoms period of ancient Chinese history. For many, this will be a motivating and engaging way to learn. For others, the story may not inspire the same level of interest. If you would like to get a taste of the story, and the book in general, it is recommended that you read the free sample chapter.